2. Melt butter with whole milk and 1 tablespoon vanilla in a pan over medium-low heat, being careful not to burn. Set aside and let cool. 3. Beat eggs in a large mixing bowl, then whisk in sugar until dissolved. Thoroughly add in wet mix from step 1. 4. In a separate mixing bowl, combine flour, baking powder, cinnamon and salt. Gradually add to wet batter. 5. 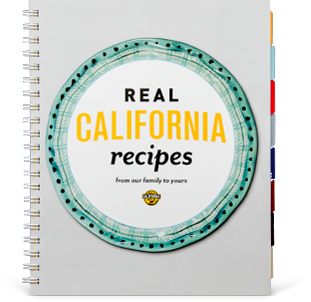 Grease a 9x13-inch baking pan with Real California Butter, then pour in batter. Bake for 30 minutes. 6. Meanwhile, pour the condensed milk into a saucepan and bring to a gentle boil over medium-low heat. Mix in strawberries, blueberries and raspberries, then add evaporated milk, heavy cream and vanilla extract. 7. Using a wooden spoon handle or something similar, poke holes in the cake 1-2 inches apart. Pour the berry-milk mixture over the cake, making sure the cake is completely covered. Refrigerate for 3 hours. 8. Shortly before serving, make the frosting: In a bowl, combine heavy cream, sugar and vanilla with an electric mixer or a whisk until stiff peaks form. 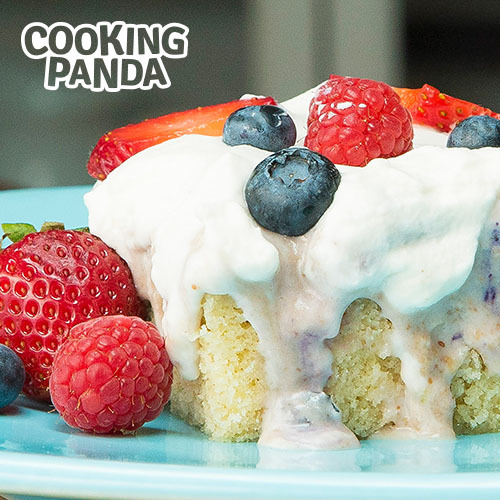 Spread the frosting over the cake, then top with mixed berries.